Magna on Stronach: "The Stronach compensation arrangements will not be renewed." TORONTO (Reuters) -- Canadian supplier Magna International paid $52 million (37.2 million euros) in consulting fees to billionaire founder Frank Stronach in 2013, but the company is stressing that his compensation will stop at the end of this year. 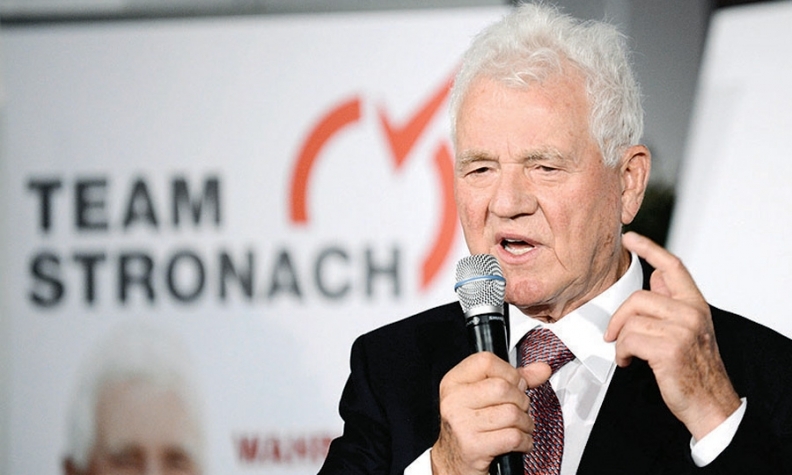 Austrian-Canadian Stronach, who started the auto parts giant in a Toronto garage in 1957, was paid roughly $900 million to cede control of Magna under a contentious 2010 buyout deal. Under the terms of that court-approved plan of arrangement, Stronach was paid 2.25 percent of Magna's 2013 pre-tax profit. That rate drops to 2 percent in 2014, the final year of compensation. "The Stronach compensation arrangements will not be renewed, extended or replaced with any other form of compensation," Magna said in a circular filed in advance of its May 8 annual meeting in Toronto, underlining the word "not." Stronach was paid $47 million in 2012 and $38 million in 2011 for consulting services under the agreement. He ceased to be an officer of the company in 2010 and resigned as a director in 2012. Stronach's sole relationship with the company in 2013 was as a consultant, the company said. Stronach quit the Austrian parliament in January, after founding a party that won only 6 percent of the popular vote and 11 seats in September elections. After the payments to Stronach end, effective Dec. 31, Magna will reduce the profit-sharing cap for senior executives to 3 percent of pre-tax profit from the current 6 percent. The move is meant to "give shareholders the certainty that the profit-sharing percentage which had historically been paid to Mr. Stronach will not be allocated to anyone else," the company said in its circular. Magna CEO Don Walker received nearly $19 million in total compensation in 2013, Chief Financial Officer Vincent Galifi received $7.6 million, and Chief Operating Officer Tommy Skudutis got $7.5 million. Compensation for Chief Legal Officer Jeffrey Palmer was $5.5 million and Guenther Apfalter, president of Magna Europe and Magna Steyr, received $3.5 million. Magna has more than 125,000 employees at 316 manufacturing plants and 84 development, engineering and sales centers in 29 countries.